We don’t often stop to think about it, but we’re all constantly making decisions based on incoming stimuli, and vice versa, our words and actions impact the behaviour of others. One of the most cited books on this subject is Robert Cialdini’s Influence: The Psychology of Persuasion. First published in 1984, Influence remains an essential item for every marketer’s reading list. A large part of successful referral marketing lies in understanding and channelling that perfect mix of persuasive ingredients that convinces us to act. People like to return favours. Cialdini cites an infamous social experiment to prove it: In 1974, Phillip Kunz, a sociologist, sent out 600 Christmas cards. The key detail: they were all complete strangers, picked out at random. Despite not knowing a single addressee, Kunz received over 200, mostly enthusiastic and thankful, Christmas cards in return. Why did so many people respond to a stranger? In short, it’s the rule of reciprocation. People are conditioned to follow the rule of “give and take”. A good refer-a-friend programme should make it clear to all parties how they each win. If an individual is aware that the friend who referred them will also benefit, it makes them more likely to buy. So, make sure you clearly communicate the mutual benefits of your referral reward. The desire for consistency comes down to wanting to align our external behaviours with our inner beliefs and values. When we make a promise, we feel obliged to fulfil that promise. When we make a decision, we like to subsequently feel like that was the right decision and when we commit to something, we like to justify the commitment. This rationalisation is why when someone does someone else a favour, they tend to view the recipient of their good deed more favourably after the fact — acting as retrospective affirmation of their endorsement of that person. The rule of commitment and consistency. Don’t be afraid to ask for repeat referrals. When a customer commits to referring your brand, the rule of consistency and commitment suggests that they are more likely to refer again because doing so reinforces their belief that the initial referral was a wise decision. Human beings are tribal by nature. If we’re uncertain how to act, we take our cue from those around us. To demonstrate how strong this urge is, Cialdini references an experiment where one or more people in a public setting suddenly fix their gaze up into the sky. Steadily, a growing number of bystanders would join them, looking up to see what the others were staring at, until the point where crowds would form… all looking at nothing in particular. Social proof in action. Don’t overlook the opportunity to reinforce the peer-to-peer endorsement of your campaign. Whether it’s through quotes or displaying the number of other happy customers who’ve taken up your offer so far, it’s all about framing the action of sharing your referral offer as an expected social norm. We’ve run several experiments around this topic and as have found that adding social proof to copy can lift the conversion rate at that step of the funnel between 5%-25%. Cialdini uses the example of “Tupperware parties” to demonstrate the rule of liking. These were basically social get-togethers (engineered by a Tupperware sales rep) used as an opportunity for friends and neighbours to share, discuss and endorse Tupperware products. People were far more likely to buy the product if its virtues were being communicated between familiar and friendly faces. Often we end up buying a particular product simply because the person selling it to us is someone we like. Remind your potential new customers of the relationship between your brand and their friend. Make sure that the referring friend’s name is prominently featured and you will instantly associate their potential purchase with positive feelings toward that person. No matter how wonderful your brand is these feeling of friendship are likely to be much more powerful than those you can inspire alone. Ultimately, selling a product is all about building up trust and in order to be trusted, you need to position your brand as an authority. Cialdini writes about the sense of duty to authority within us all. He says, people will tend to obey authority figures, even if they are asked to perform objectionable acts. The Milgram experiment infamously demonstrated this theory. An authoritative identity is built by demonstrating professional credentials and expertise. Build badges of trust. Ensure your branding is sharp and professional. Sprinkle content with plenty of cues that reinforce your professional knowledge and expertise. Clearly communicating your product’s unique selling points and value proposition is crucial. Of course, the seal of authority that comes from your referrers themselves is also very powerful. Testimonial quotes and case studies can really boost conversion rate. 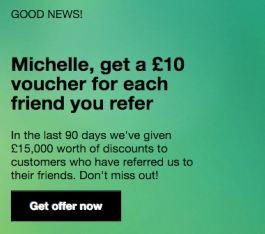 If you’ve collected any kind of positive feedback from the referring friend, be sure to include it in the referral offer page (E.g. John loved this product/ rated it 5/5). People will desire something more if it’s perceived as less available. This is the principle of scarcity. There are plenty examples of the principle of scarcity in action within ecommerce. For instance, sites like booking.com tell customers how many people have viewed a hotel, how many have booked, and how few rooms are left. Tactics such as this heighten anxiety over the possibility of missing out and therefore generate a sense of urgency to act as soon as possible. In referral, scarcity can be used in several ways. From restricting how long a new customer has to use a referral offer (Offer only available for 7 days) to limiting how long a referrer can share that offer. You can also use scarcity for promotion periods when you increase or change the referral offer for a limited period (a week or a weekend, perhaps) to drive activity. Uber and several of our clients do this to great effect. Cialdini’s 6 Weapons of Influence provide an excellent blueprint for referral campaign conversion optimization. Next time you’re piecing together a refer-a-friend programme, think about putting some of the above weapons of influence to use. It’s possible to understand the relative importance of all of these hypothesis using our AB testing platform. 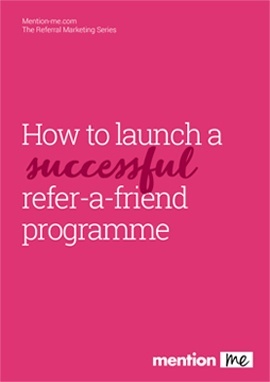 They could be the differentiators that take your refer-a-friend programme to the next level. In the next, final post in our Psychology of Referral series, we’ll explore how another common psychological behavioural technique, nudge theory, can positively influence the behavior of your target customers.